Casa Padrino offers you a very extensive and exquisite collection of illustrious fittings for your bathroom. All fittings are made of very high quality materials. That is why we guarantee that you will enjoy these washbasins for a long time. You will always be able to enjoy a noble and splendid appearance with these exquisite fittings and inspire enthusiasm among your guests. 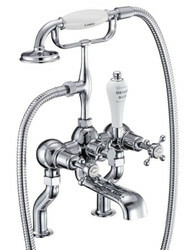 With our wide range of fittings, you will certainly be able to meet your personal needs. The design spectrum of bathroom fittings covers all facets from neutral, purist, timeless, modern, classic to elegant and luxurious. With us you also get particularly high quality designed washbasin taps. Because at Casa Padrino you will find fancy wash faucets with Eyecatcher warranty. Idealism and passion are very important at Casa Padrino. If you have questions regarding our offers, please call us on the hotline + 49-201-36577485 and our qualified support will help you in every detail! Guaranteed! Our collection will leave no wishes or expectations unfulfilled. First class, magnificent, extraordinary and comfortable, that's how we would describe Casa Padrino furniture. Our entire baroque, antique, rustic or luxury furniture collection is also ideal for hotels, boutiques, shops, clubs, cafes and restaurant outlets. Casa Padrino, your specialist for baroque furniture, antique furniture, luxury furniture, country house furniture and many other furniture styles.